Do you have an inner feeling that you are being underpaid despite performing well in your office? You are not alone to face such a dilemma. Most people hesitate to ask for an appraisal, thinking that it would portray them as self-centered or too individualistic. Such a reservation plays in the minds of people of all age groups, from junior level executives to Presidents of MNCs. This feeling and hesitation are natural but they do not act in your favour. Many times, firms and organizations benefit from such feelings and manage to continue paying less even while their employees deserve more for their efforts. You must understand these tactics of the organization. You should also know exactly when to ask for a raise. When to Ask for a Raise at Work? Have you implemented a marketing strategy that has boosted the sales of your organization? You may have recommended a new technology, which helps the firm save a substantial part of its revenues annually. If you have achieved any of these goals, then this is the best time asking for a raise. The only thing that you will need to ensure is to convince your reporting manager about the benefits you have done for the company. This needs to be done with a great amount of tact. Otherwise, your seniors can make you feel that you are being selfish or asking for raise too early. You should be prepared in advance for negotiating, marketing your plus points and also revealing your other career prospects. This way, the firm or organization will weigh the risk of losing you against the pluses of retaining you. They may actually be convinced of offering a raise if you present the matters in the correct light. It’s always wise to ask for an appraisal from a favorable position. If you have recently got another job offer from another company, you will have a better chance to get a salary hike when negotiating a raise. There is no reason to be afraid to tell your boss that you have received an offer from a different company. Tell him that you would stay back, but you would require a salary hike to do so. If he feels that you are a valuable asset for his company, you will receive a salary raise. However, be truthful. Speak about quitting only if you have a new job offer at hand. Don’t bluff by saying that you have another job offer if really don’t have one. This could fail if your boss refuses your appraisal request. If you do not have a second job opportunity to fall back upon, things may go wrong in your office. It might be that you were asked to bring in four new projects this quarter, and you brought six. Or, you were asked by your reporting manager to make a new advertising campaign in two months which you completed within one month. If you have not just met, but surpassed your goal, it is the perfect opportunity to ask for raise, provided you perform consistently. Try achieving your goals within the set timelines. In your race to complete the task within the set deadlines, do not forget to maintain the quality of your work. You must remember that your reputation does not depend simply on how much work you complete, it also depends on how well you execute the tasks. Your main aim should be to show your boss how valuable you are to the company. The best time to ask for an appraisal is when you have exceeded his expectations. You need to make sure that you handle all the critical tasks wisely. While speed maybe significant, even more important is your efficiency and reliability. Do not compromise on these qualities in a race to do better than others. If your boss instructs you to train a new employee, it clearly signifies that he values the quality of work that you do. He thinks that you are good enough to mentor the new joinee. So, you can remind your boss that you have an added responsibility of training a fresher. Make sure you do complete justice to the job you have taken in hand. Training a fresh candidate surely puts your knowledge to test. A person who has thorough knowledge regarding a subject will have no difficulty sharing it with juniors. On the contrary, individuals who lack confidence in their knowledge can never pass on what they know, to juniors. If you have successfully trained a candidate, you surely qualify of getting a raise in your salary. 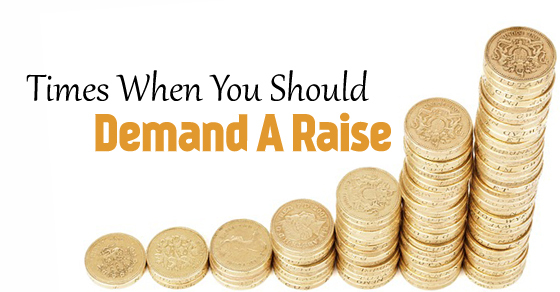 You can speak confidently regarding your desire for a raise. Though your entire firm may not be earning huge revenues, your department may be excelling, and generating a substantial sum as revenue. If that is the case, then you have a valid reason requesting a raise, even if the company isn’t making huge profits. Provide him with valid details about the achievements of your team. Tell him the significance of a raise in motivating determined candidates like you. You can also try and explain how you plan for the future projects and ways the company will benefit from the same. These are sure to help you get a raise in salary if you are a deserving candidate. Make sure you speak effectively. The performance of each employee is reviewed periodically in all firms. If you have done well consistently, then you can list your accomplishments and present them to your reporting manager when your performance review assessment takes place. During the annual reviews, you do not need to specify your desire for a raise. The performance reviews are conducted with the same goal in mind. You must make it a point to present your positives effectively in front of your bosses and reporting managers. Make sure you do not overdo it as this may appear like you are boasting. Speak less but present the facts effectively. That is the only way to have a greater chance of getting a raise at work without causing a negative impression. A good performer in a firm is an individual who can work well even under pressure and in stressful situations. These are individuals who are willing to take a certain amount of risk too if that helps them get to their goals. Such individuals also strictly adhere to the company ethics and keep the company goals as their first priority. If you really do well, then your quality of work will be appreciated not only by people within your team but by other departments as well. This will help you to present your achievements to your boss, citing the ways in which you as an employee helped in the growth of the company. Once you reach a higher position in the company hierarchy, it becomes a bit difficult to be upfront and blunt regarding a pay raise. You should possess the knack to present the matters subtly without causing misunderstandings or negative impressions. This is the perfect opportunity for you to ask for a raise. You have been promoted to a higher profile on the basis of your merit and performance. If no tangible financial benefits are mentioned by the HR department, then you will need to inform your boss about the reasons why you deserve a raise. You need to be extremely careful while tackling such tricky situations. If you choose the wrong words, it may create a wrong impression. The seniors may even trap you in a web of words. So be cautious. Phrase it in a way that shows how much a person at your designation truly deserves. You must also reveal that if you do not get the pay you actually deserve, you are being underpaid. Never be rude or blunt when you request for a raise. It should be professional but not too blunt or curt. Remember that whether you get raise in pay or not, you need to work with the same organization. Do not make your bosses feel that you are in dire need of money or you are greedy for the same. Show them how correctly you deserve the pay increase or raise. Self assessment is most important. You need to ask yourself first whether you deserve the raise. If you really think you deserve it, there is no harm in asking. Previous articleIs it Bad to Quit a Job after 4, 5, 6, 7 or 8 Months?